In her seminal study of the Ayodhya dispute ,”Rama and Ayodhya“, Meenakshi Jain puts forth arguments that confirm the fact that the Babri Masjid was built on top of an existing structure, a temple marking the exact spot where Ram was believed to have been born. Jain has referred to literary and religious texts and testimonies of Muslim writers, of European travellers and British administrators, besides gazetteers, judicial and land revenue records and reports. Underlining these is the wealth of evidence unearthed by the Archeological Survey Of India (ASI) that leaves no room for doubt that the Masjid was built on a pre-existing Vishnu temple. For anyone who isn’t clear about the dispute over the Ramjanmabhumi Temple and the Babri Masjid, this is your go-to book. Meenakshi Jain has painstakingly researched and detailed the subject from multiple angles. She has referred to primary sources, leaving no scope for challenging her work. There is no speculation, bias, or hearsay. Representatives of the Vishva Hindu Parishad (VHP) and the Babri Masjid Action Committee (BMAC) had decided that they would each present to the government evidence supporting their respective stands. The evidence would be placed under four heads: History, Archeology, Revenue Records, Law. Jain traces the antiquity and prevalence of the Rama Cult back to over 2000 years, and concludes that the entire text of the poem had been completed by the second-third century CE. She writes: “The Ramayana seemed to have originated in the Kosala region, ruled by the Ikshvakus of Ayodhya.” Court bards, and wandering minstrels were already reciting and singing the story. she offers evidence that it was to be found all languages and states. Valmiki’s “Ramayana” builds around the nucleus of the existing story of Rama. Meenakshi Jain cites evidence that the story is not fictional. 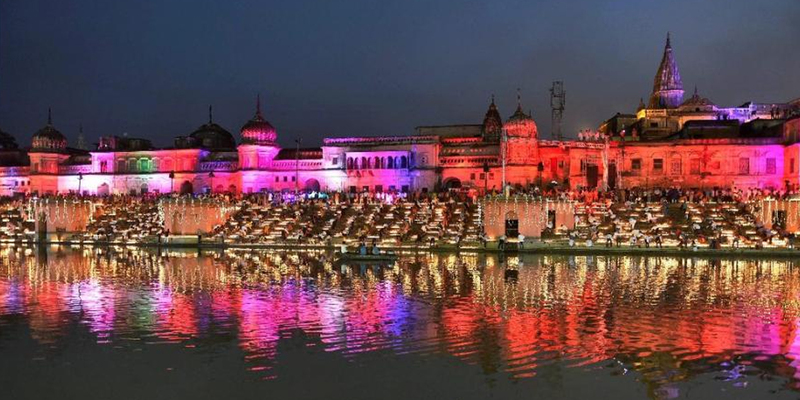 Ayodhya, and other cities named in the “Ramayana” did exist. The basic story about Rama, Sita and Lakshman, and their exile, and Sita being kidnapped by Ravana is true. Ravana was a normal dark-skinned man belonging to the Gond tribe. Rama and Lakshmana and the Gonds fought with bows, arrows, spears and swords, while the aboriginal tribe, Vanaras, fought with missiles like trees and stones. The fervour and devotion with which Indians regarded the “Ramayana was well-documented by Indian and British scholars. The Ramayana held the. Prof Habib now launched a scathing attack on Prof. B.B.Lal’s report on the archeological findings. He alleged that Prof. Lal was biased, and had pre-dated his findings to accede to the demand for demolishing the mosque and constructing a temple therein. Yet more archeological evidence, temple artefacts, and inscriptions surfaced. But the most significant evidence was in the form of a rectangular stone slab measuring 115 cms x 55 cms, with a Sanskrit inscription of twenty lines. It mentioned King Govindachandra of the Gahadavla dynasty and alluded to Vishnu’s incarnations as Narasimha, Krishna, Vamana and Rama. Prof. Habib led the charge with arguments against the finds ranging from not a part of any temple, planted there by interested parties, not a part of this structure to appropriated from Lucknow Museum, and being passed off as a find from Ayodhya. The ASI discovered artefacts belonging to the first millennium BC. Further layers revealed objects from the Shunga period, the Kushan period, the Gupta period, the post-Gupta period and the early medieval period. Above these lay evidence of a massive structure built between the 12th and the 16th centuries. It was inferred that there were seventeen rows of pillar bases, each row with 5 pillars and on this massive structure was the Babri Masjid constructed in the 16th century. ‘Ram and Ayodhya” establishes that there is no record of any waqf land being granted to the Babri Masjid. The property listed as malkiyat -i-ala could not be regarded a Muslim waqf. The land grant had been made by the British government, a non-Muslim body, and could not be regarded as a Muslim waqf. Also, mosques were meant to be constructed in densely populated Muslim areas, making it convenient for them to offer prayers, not in a majority Hindu holy place with temples and sacred ghats. The reasonfor this was that the mosque predated the Muslim population. While a site was considered sacred in Hindus, there was no specificity of that kind with Muslims, who were free to offer namaaz anywhere. Also, the court noted that no prayers had been offered at the mosque since 1949. Meenakshi Jain rounds off the book with numerous legalities concerned with the disputed structure, and also a number of legal pronouncements by the Allahabad High Court on the subject. Jain includes excellent pictures of seals, coins, murtis, excavated areas, the black stone pillars and maps pertaining to the structure, and the large stone slab with details about the temple inscribed in characters from the twelfth century CE. A highly recommended book, for its elucidation on the dispute, and its strong evidence under different heads. It could well prove to be the definitive reference book on the Ayodhya dispute. Vina Leekha has been a practicsing psychologist, an English teacher, a feature writer and a blogger.